At the southern end of the beautiful Llanthony Valley in the Black Mountains stands Llwyn Celyn, an exceptionally important house. It was built in 1420 on the lands of the Llanthony Priory and is a very rare survival from so soon after the destruction caused by Owain Glyn Dwr’s Rising against the English Crown. 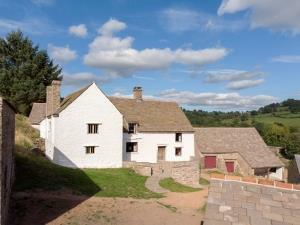 Possibly a prior’s house, Llwyn Celyn is rich in rare medieval features and has barely changed since around 1690. Sitting in the Lanthony Valley, Llwyn Celyn is perfectly positioned to explore the Brecon Beacons National Park. 10 minutes from Llwyn Celyn is Llanthony Priory, the remains of a 13th-century priory. The site is open all year round, with free entry and nearby parking.